My daughter wanted me to blog about Lego today. The result was a creative combination of preformed Lego food and her imagination, and reflects some of our favourite foods. Bread, of course, is a central part of the feast. Sliced, in this case, with a sword, because Lego does not provide bread knives. Flat round plates serve as pancakes, one of our common Sunday breakfast foods. A Lego turkey, complete with dagger as carving knife, is a response to the fact the kids have several Lego turkeys. My daughter has, in fact, never eaten turkey. Lego carrots are common, so naturally there is a bowl of carrots on the table. A bowl of small red bricks represents balsamic glazed tomatoes—a lovely part of any feast. There’s plenty to eat. 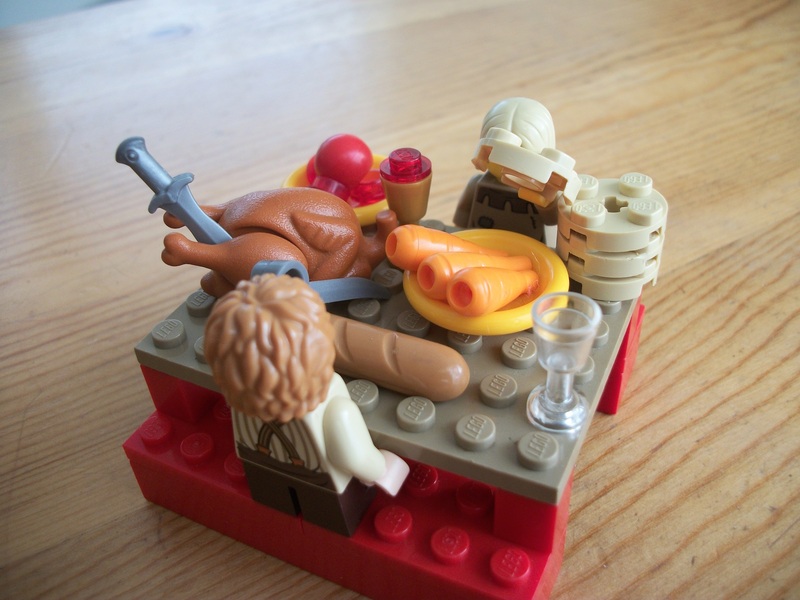 Come join us at the Lego feast!